The Supreme Court’s free-exercise jurisprudence is defined by two cases at opposite ends on the continuum of religious exercise cases. Employment Division v. Smith established the rule that religiously motivated conduct is not exempt from regulation by means of a “valid and neutral law of general applicability,” exemplified there by an “across-the-board criminal prohibition” on possession of the drug peyote. 494 U.S. 872, 879, 884 (1990). Church of the Lukumi Babalu Aye, Inc. v. City of Hialeah, a unanimous opinion issued just three years after Smith, struck down a gerrymandered system of ordinances applying to Santeria practitioners and almost no others as falling “well below the minimum standard necessary to protect First Amendment rights.” 508 U.S. 520, 543 (1993). Most laws fall between the extremes of Smith’s no-exception prohibition and Lukumi’s religious gerrymander. This Court's free-exercise jurisprudence is defined by two cases with facts at opposite ends of a continuum. The Court decided them a quarter century ago, and it has provided no further guidance despite a growing circuit split. Lower courts that carefully examined this Court's opinions found a clear rule that governments must treat religious conduct as well as they treat analogous secular conduct--or face strict scrutiny. But that rule has not been unambiguously stated, and the Ninth Circuit entirely missed it. This case involves a dispute over property where petitioners and their congregants have worshiped for many years—some for centuries, before any denominational body existed. App. 151a. 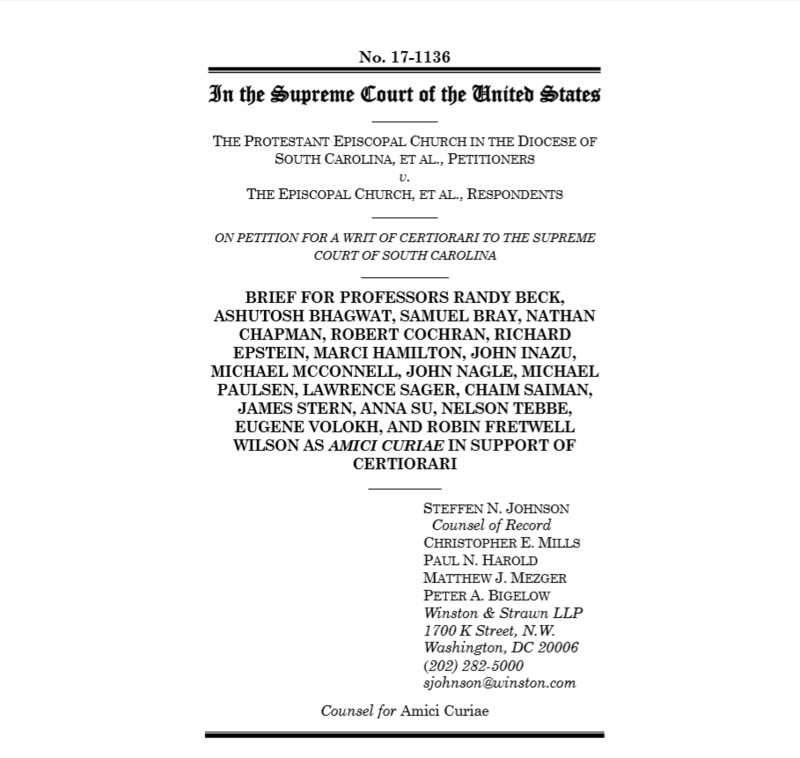 The property involved is held and titled in the names of petitioners, which are 29 parishes, the Protestant Episcopal Church in the Diocese of South Carolina, and the Trustees of the Protestant Episcopal Church in South Carolina. App. 171a. Nothing in the deeds references any trust in favor of respondents, the Protestant Episcopal Church in the United States of America et al. Ibid. Moreover, the property at issue was purchased, maintained, and possessed exclusively by petitioners. App. 175a. Throughout the history of the parishes, the “parishes and their parishioners worshipped on property titled in the individual parishes’ names, which the parishes owned in fee simple.” App. 78a (Toal, A.J. ).